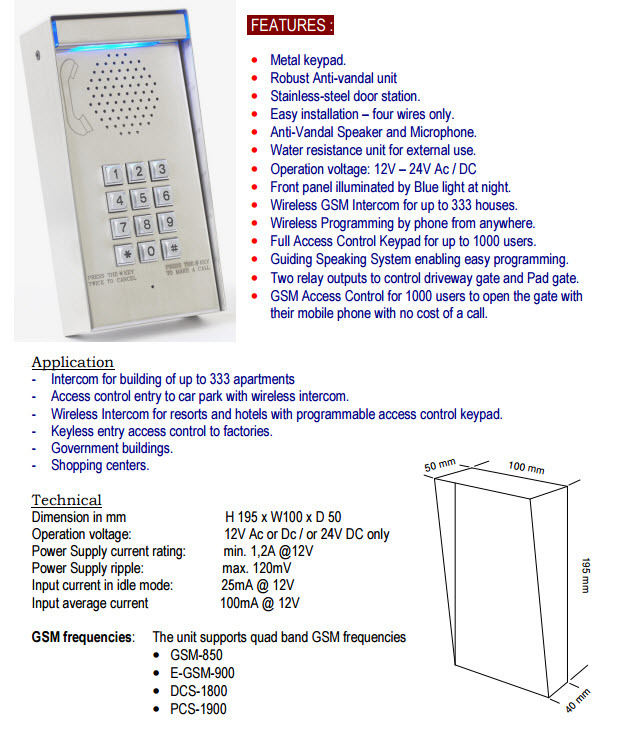 Multi-Channel wireless intercom with GSM Access Control System / works with 4G GSM network . The system is made of an anti-vandal stainless-steel enclosure with a waterproof metal-keypad. For example, a complex of 330 units (or apartments, factories, offices) that have a mutual entry pedestrian gate for visitors and a driveway swing gates for the car park. This Hi-Tech and cost effective multi-units-intercom requires only connection to power and simply allows any visitor to call each of the 330 units with a press of a button. When a visitor comes to the property and would like to get an access and visit one of the units in this complex, he needs to press the “CALL” button on the front door station and this smart TALKING intercom system will guide him through by voice commands. After the “Call” button is pressed, the system will announce “Please enter the unit number followed by the # key”. and after the visitor keyed-in the the unit number, the system will announce and say: “Please wait, your call will be answered shortly “. Then the intercom will call the chosen unit / apartment and allow the owner to talk with the visitor and allow him access by opening the pedestrian gate or the driveway gate by pressing the # key or the * (star key) on his phone. If the owner is not at home and the first call was not answered, the system will automatically hang up the call and dail the second dedicated phone number (which might be the Mobile phone number of the owner) that was programmed into the system for this specific unit. If the second phone number was also not answered, then the unit will call the third phone number in the system for this unit. And if all the three attempts of calling this unit failed, the system will announce and say to the visitor: ” Your call was not answered – please call later ” . In addition, this smart intercom system allows programming for each individual unit three different pin-code numbers (4 digits code) that can be used by the households to key-in on the front door station keypad and open the gate. This is not all, the system also allows programming the mobile phone numbers of each unit to allow them to use their Mobile phones and open the driveway gates with NO COST of a Call and No Range limit to enter with their cars.